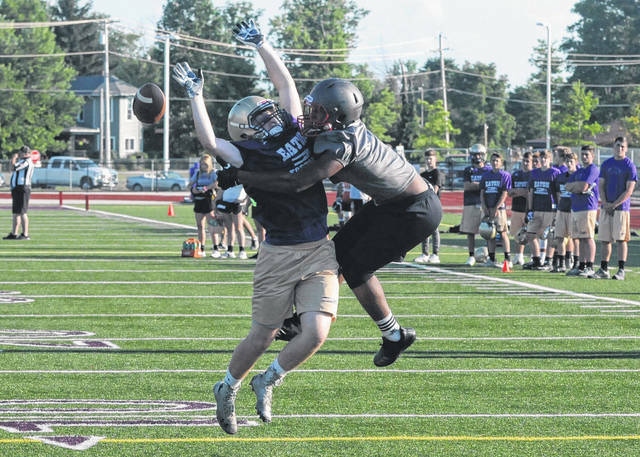 The high school football season kicks-off Friday night (Aug. 24) giving all 715 teams state-wide renewed optimism about the upcoming season and Preble County teams are among those looking to better their performances from a year ago. PREBLE COUNTY — The high school football season kicks-off Friday night (Aug. 24) giving all 715 teams state-wide renewed optimism about the upcoming season and Preble County teams are among those looking to better their performances from a year ago. Eaton returns just six starters from a team that went 3-7 last season. Brad Davis enters his fourth season at the helm with only 34 players on the roster. In all, Eaton returns nine letter-winners. Anna Black (Sr), K; Ryan Venable (Sr), QB/DB; Caleb Puckett, (Sr) RB/DB; Skyler Straszheim (Sr), LB/OL; Jarod Lee (Jr), LB/WR – 2017 2nd Team SWBL, Zac Schmidt (Jr), WR/DB – 2017 2nd Team SWBL. Other key players returning include; Chris Weadick (Sr), LB/WR; Nick Smith (Sr), DL/OL; Gabe Mirovsky (So), DB/WR; and Carson Shafer (So), DL/OL. Davis said the freshman class could make an impact this season. “We’re really excited about the freshman class. There’s going to be some guys that push for a spot on Friday nights. That competition at key positions is invaluable and, quite honestly, we haven’t had much of the last few years,” he said. Davis believes his team is capable of competing each game. “We expect to compete in every game and put ourselves into a position to win every game,” he said. Davis said keeping players healthy will be a key to the season. “As always, we have a tough pre-season schedule with our scrimmages. We believe those prepare us well for our out-of-conference games and certainly for League play. Position and player depth is a big issue this season, so we have to smart and efficient with practices and guys have to take care of their bodies with proper nutrition, hydration, and rest,” he said. National Trail returns 16 players from last season and coach Mark Hoffman sees that as an advantage. This year’s senior class includes Mike Bowerman, Evynn Short, Tye Baker, Troy Watson, Quintin Spence, Justin Watts and Cole Yount. Hoffman said the juniors to watch are Zach Woodall, Peyton Lane, Colten Everman, Joe Lawson, Colton Toms and Caleb Brinkley. 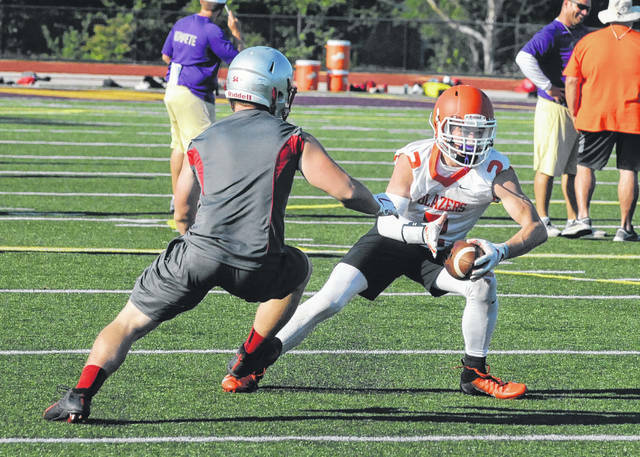 Hoffman said teams in the Cross County Conference are struggling with getting players out. Hoffman said one of the team’s strengths is the offensive line with Baker (6-5, 375) and Brinkley (6-4, 270) as the anchors. He said the team has a pair of veteran running backs in Peyton Lane and Joe Lawson and a solid receiving core led by Zach Woodall and speedsters Kaleb Zaphfe and Jacob Rey. Short returns to run the offense at quarterback. The Blazers will play multiple defenses. Hoffman has added veteran coach Frank Carr to the staff this season. Jeremy Horn will coach both offensive and defensive lines and Eric Hoffman will once again head the offense and do the play calling. “We are excited for Friday nights and with the backing of the community how can it be anything but good at Trail,” Hoffman said. David Maddox takes over at Preble Shawnee a year after a record breaking season. The Arrows finished 8-2 on the field. Returning on offense is junior QB Jake Green, lineman Tyler Stevenson, WR Austin Tutt, linemen Kanyon Schall, Jordan Stubbs and tight end Bryce Singleton. “Jake had a solid year as a sophomore. Has progressed very well since last year and has stepped up into a leadership role. Looking forward to Jake having a good season,” Maddox said. “Tyler received 2nd team all league honors as a sophomore. Tyler is the leader of our offensive and defensive line. Very tough player,” Maddox said. Defensive returning starters are junior DL Ben Hobbs, junior DL Tyler Stevenson, senior DL Eddie Kincaid, senior DL Bryson Trantanella, junior DB Austin Tutt, junior DB Gunner Powers, senior LB Jordan Stubbs. Other key players returning are junior Eyan Haemmerle (DB) who worked hard all off-season and looks really good at corner so far, according to Maddox. Singleton played TE last year and is playing linebacker now as well. Senior JJ Hatmaker (LB) looks good as well, according to Maddox. Sophomore Tristan Sizemore (OL/LB) has been playing very well so far and sophomore James Gibson (RB/LB) is also playing very well. Newcomers include Junior Sam Agee (WR/DB) is a very nice addition to our group of wide receivers. Very excited to have him playing football. He is a nice threat to have as a wideout, according to Maddox. Sophomore Travis Howard (RB/LB) has been a great addition to our defense so far. Very athletic player that is a good tackler,” Maddox said. “Shawnee football is in a very good state right now. We have had two straight winning seasons and I do not expect that to change this year. Our success the last two years is not a fluke. We are a good team with good players that play as hard as they can. The players are confident and have realized the level of success that they are capable of having. They still do not believe we are respected as a good football team and that motivates them to work hard and earn that respect,” Maddox said. Despite graduating several keys players Maddox feels the number of players in the program is at a good place. Clint Bartlett returns for his third season at Twin Valley South. Coming off a 3-7 season, the Panthers will rely on several returning players to help improve that mark. QB/DB- Cade Cottingim (Sr.) – Will be 4-year letter winner, All-CCC honors. WR/DB- Chandler Napier (Sr.) – All-CCC, 1st team All-SW District Honorable mention all-state and led Conference in TD receptions last season. Newcomers include, Tytus Woodgeard (Jr.), Jayden Bassler (Sr.) and Riley Maggard (Fr.). “Should be a good year. We have numerous guys coming back with a lot of varsity experience. We are going to have to work hard and get better every week. Every week we are going to have challenging opponent. There are definitely no easy wins on our schedule,” Bartlett said. South opens with Dixie and Preble Shawnee.